What Does Microsatellite Status Mean for Endometrial Cancer Patients? Thanks to recent advances in our understanding of cancer biology, scientists have identified several specific molecular alterations that can affect both treatment of advanced endometrial cancers and genetic testing for certain patients and their families. One of these is microsatellite instability. If you or someone you love have been diagnosed with endometrial cancer, here’s what you need to know. Every cell in your body contains DNA, a molecule that contains your unique genetic code. When cells divide, for example to grow or replace old cells, your DNA makes a copy of itself (replicates). Cells must divide quickly and copy your DNA without making errors. However, errors in this process are common. “Microsatellite are small runs of DNA repeats that are more prone to getting damaged,” says Ursula Matulonis, M.D., chief of the division of gynecologic oncology at the Susan F. Smith Center for Women's Cancers at Dana-Farber Cancer Institute. Left unfixed, these errors can cause mutations that may eventually lead to cancer. Fortunately, your body has a mechanism for repairing these errors called mismatch repair (MMR). MMR proteins recognize and fix DNA damage after replication. Think of it as a DNA spell checker. Sometimes, however, this system doesn’t work as well as it should. When cells are mismatch repair deficient, they are more likely to acquire DNA mutations that may lead to cancer. This results in a situation called microsatellite instability (MSI). About 20 to 30 percent of women with endometrial cancer have poorly functioning MMR. MSI can happen at the germline level, which means it occurs throughout the body, Jessica Lee, M.D., tells HealthCentral. Dr. Lee is an assistant professor of obstetrics and gynecology at UT Southwestern Medical Center. However, says Dr. Lee, MSI can also happen just at the level of the tumor. Microsatellite Instability has implications for endometrial cancer patients in two important ways. MSI may indicate you have a genetic condition called Lynch syndrome. Patients with Lynch syndrome have tumors with a higher frequency of mutations. This put you at greater risk for endometrial cancers as well as other types of cancer, including colon, ovarian, gastric, hepatobiliary, urothelial, and some skin and central nervous system cancers. Roughly 3 to 5 percent of all women with endometrial cancer have Lynch syndrome and are therefore predisposed to developing additional cancers. Dr. Lee says it’s important to identify people with Lynch syndrome. Once you or your family members know you have Lynch syndrome, you can take steps to prevent Lynch-related cancers, or at least catch them in an early stage. Frequent colonoscopies — every year or two instead of every 10 years — will help prevent colon cancer. Regular biopsies can catch endometrial cancer early. Once you’re done having children, or are between age 40 and 45, you can have your uterus and ovaries removed. “There are different ways we can monitor and do interventions to prevent people from getting cancer,” says Dr. Lee. When women are diagnosed with endometrial cancer, their tumors are routinely tested for MSI, Dr. Matulonis says. If you are microsatellite stable, meaning you don’t have MSI, your DNA repair process is operating normally. If you’re microsatellite unstable, meaning you do have MSI, it’s a good indicator that you may also have Lynch syndrome. 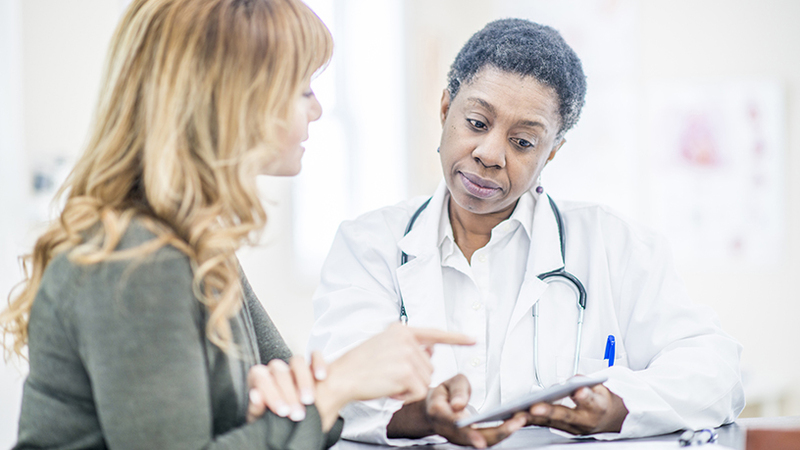 Women with recurrent endometrial cancer (cancer that has come back after treatment) who have microsatellite unstable tumors may be candidates for an immunotherapy treatment called pembroluzimab (Keytruda). “This is the first situation in which a drug was approved not for a specific tumor, but for a specific genetic event,” says Dr. Matulonis. There is still a lot to learn about which patients will benefit most from pembroluzimab, Dr. Matulonis says. It’s also important to balance the potential benefits against the potential harms, which are not insignificant. The most common toxicities of permbroluzimab include pneumonitis; colitis; skin rashes; glandular problems, such as hypothyroidism or even diabetes; and liver toxicities, including hepatitis. Furthermore, the drugs are costly, so oncologists want to be sure they’re using them appropriately. Endometrial cancer is the most prevalent gynecologic cancer in women worldwide, and the incidence is increasing. Abnormal vaginal bleeding is the hallmark symptom of endometrial cancer. If you have any bleeding in menopause, excessive bleeding during periods, or unusually frequent periods, seek medical attention. And, if you have a strong family history of cancers that might indicate Lynch syndrome, ask your doctor about genetic testing. Kathleen Hall is a health writer who writes articles for consumer and health professionals as well as health care marketing material for corporate clients. Kathleen has a BS in psychology from the University of Maryland, an MBA from Virginia Commonwealth University and is a member of the Association of Health Care Journalists. She divides her time between Richmond, Virginia, and Bar Harbor, Maine. Kathleen is also a professional artist and runner. Do You Need MSI Analysis for Your Endometrial Cancer?